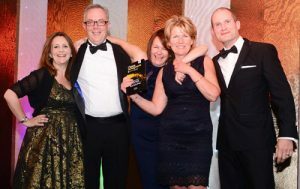 The Brain Injury Group’s training programme won the inaugural Training Award at the Claims Management Awards 2017. Acknowledged by the judges as probably one of the most important awards that can be made, the Brain Injury Group was praised for ‘doing a fantastic job’. Group’s learning and development programme also provides law firm members with exclusive access to a series of one hour training sessions delivered at their convenience by associate members. These cover a range of issues that lawyers managing catastrophic injury cases come across on a regular basis as well as issues relating to managing their businesses. The awards were hosted by comedienne, writer and actress Lucy Porter, and the training award was sponsored by Coplus. Lucy Porter; Francis Lacy Scott (asb aspire); Julie McCarthy (Brain Injury Group); Sally Dunscombe (Brain Injury Group); Jason Tripp (Coplus).